HP: “The iPhone 6s is here and the only thing that’s changed with touch is everything”. Not much has changed except.. it feels different. Now you press lightly to Peek and deeper to Pop. It changes how easily you can Peek a flight, check a post, search for dinner..
Oh, you guys are gonna love that place! You can find a getaway easier. Wait, are you listening to your own song? 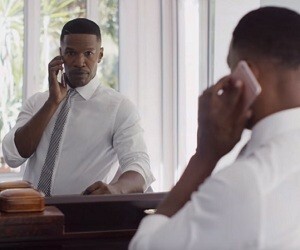 Jamie Foxx: No, I was.. Uh, hello? So pretty much everything you do feels different.